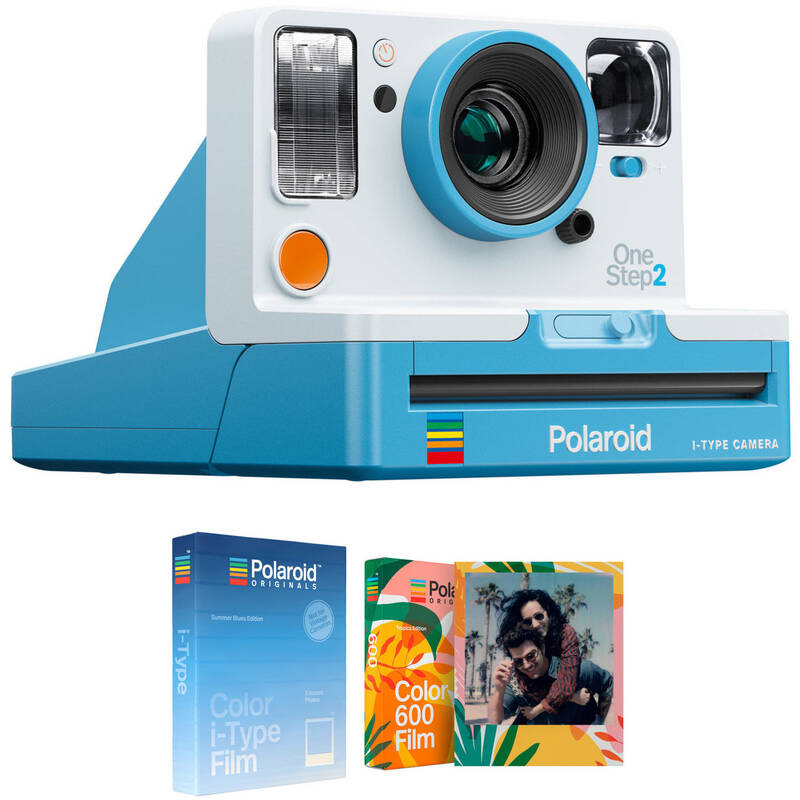 Comprising everything you need to get started, the summer blue Polaroid Originals OneStep2 VF Instant Film Camera with Summer Blues and Tropics Editions Film Kit from B&H bundles the fun and easy-to-use camera with one pack of Summer Blues Edition instant film and one pack of Tropics Edition instant film. Based on the original Polaroid OneStep from 1977, the OneStep2 VF from Polaroid Originals is a contemporary take on the classic instant film camera. Designed to be simple and easy to use, this camera accepts both i-Type and 600 instant films to produce 3.1 x 3.1" prints, and has true point and shoot functionality. The recognizable form factor of the camera recalls its predecessor, but has an updated summer blue polycarbonate shell with an integrated extended optical viewfinder for accurate framing, a built-in flash, self-timer function, and a familiar bright red shutter release. The fixed 106mm lens offers a comfortable field of view for everyday shooting, and its fixed focus design suits photographing subjects as close as 2' away. Powering the camera is a built-in 1100mAh lithium-ion battery pack, which is rated for up to 60-days of use per charge. Box Dimensions (LxWxH) 7.25 x 5.1 x 4.35"